Talkingink custom t-shirts takes the guess work out of t-shirt sizing. Whether you come into the shop, order by phone or email, or design your shirts online. You’ll have access to a size chart for the brand of shirt you are interested in. All brands have a certain sizing criteria they must meet. However when you get into trendy styles with sleeve shortening and body tapering the fit of a shirt can feel like it runs small. Me personally, I wear a medium in 90% of the apparel we sell. On some sizes I will bump up to a large because the look of the shirt is nice but the sleeves might be just a tad shorter or the taper may be tighter than I like to wear. So these styles mediums do fit but I don’t like the way they fit me. It’s not the look I’m going for. So size charts are great and we have the experience to let a customer know if something runs small or large or if a particular look is better to have in a larger size to compensate for shrinkage. Women’s shirts are the hardest but generally everybody has an idea of what shirt size they need. But when in doubt, whether you are on our online catalog or choosing a shirt in our online shirt designer, there will be a size chart available for each style. Your everyday brands like Gildan, Jerzees, Fruit of the loom, and Hanes will all fit the same. Their whole line of tees, tanks, and sweatshirts will fit the same. The only time customer may want to look at changing sizes is on fashion cut shirts. These are you tapered slim fitting shirts. Then there are the fashion brands where everything is tapered and slim fitting. Generally these will fit true. The best thing to keep in mind is sleeve lenght and taper on any particular shirt. What t-shirt size an i? Paying attention to sleeve length and cut will help you determine that. Cap sleeves or euro sleeve mean the sleeves are very short. Tapering means through the body the shirt fits slimmer. Junior fit shirts always run a size or two small. These are meant to be tight fitting. 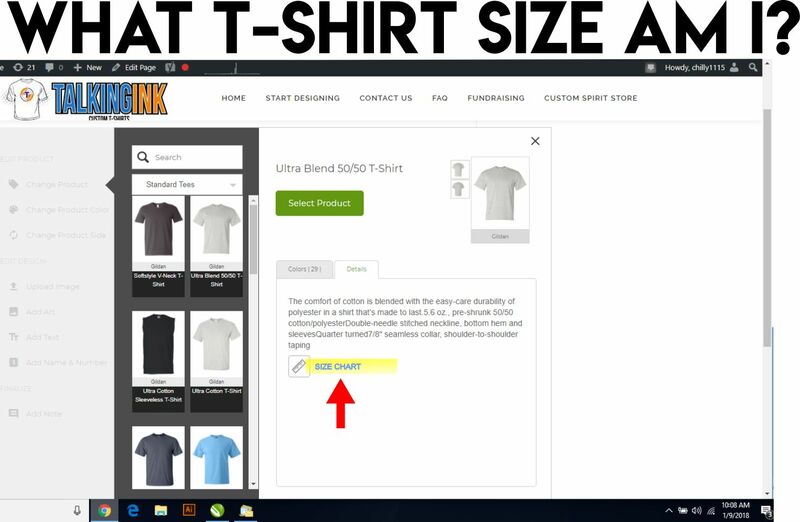 Talkingink will adjust your size for you. Of course we have samples at our physical location as well. what t-shirt size am i? The best answer to that question is to know what shirt size you own the most, and Talkingink’s custom t-shirts will fit accordingly.